Do you love Stewed Apples? 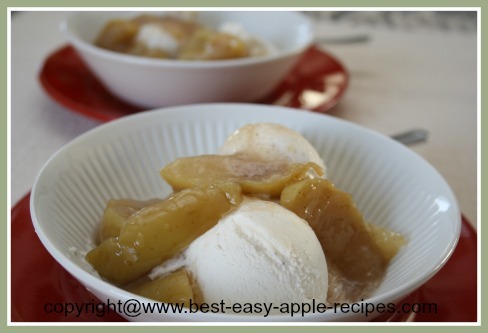 If you do, here is an easy recipe for how to make stewed apples at home. This apple recipe is great as a side dish for any dinner, as a dessert, or as a topping for pancakes, waffles, or ice cream. You can also make this recipe using a sugar substitute (see below). If you are looking for a recipe to make fried apples like the Cracker Barrel's Fried Apples, you have come to the right place! When our family travels in the U.S. a stop at the Cracker Barrel Old Country Store and Restaurant is an absolute must. Regardless of what we order, we always add a side of what they call Cracker Barrel's Fried Apples, however they are in actual fact, stewed apples ... and they are so scrumptious! Since stewed apples are such a favourite in our home, I set about trying to make as close a match to the recipe that the Cracker Barrel makes, and the recipe below is very close. Our family enjoys them as a topping over ice cream too! 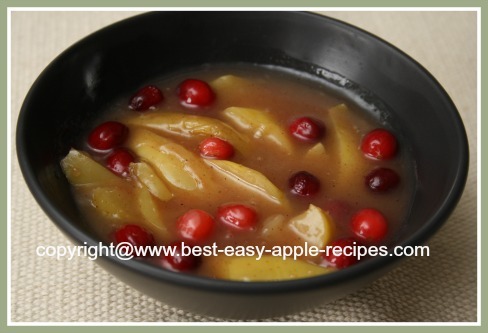 Be sure to scroll down and check out the picture of the stewed apples with fresh or frozen cranberries added ... a great idea for a Christmas or Thanksgiving apple recipe! 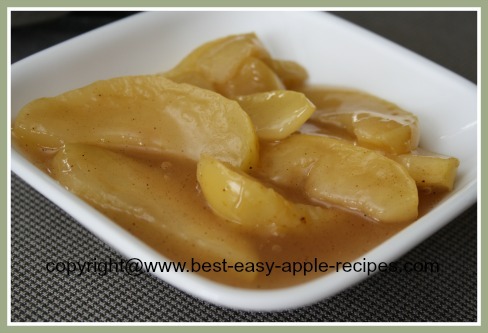 I use Golden Delicious Apples for this recipe, however many other varieties of apples will work well too -- if the peel of the apple variety you use if thick (for example, Gala Apples), I would suggest you peel the apples. 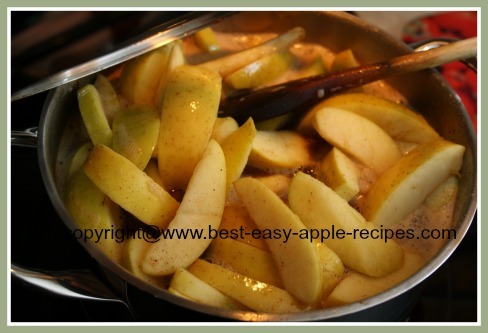 Melt the butter in a pan then 2 cups of the apple juice, the apple slices, the salt and the apple pie spice, and stir just to combine. With the pan lid ajar, heat the mixture on medium-high until it reaches a boil. 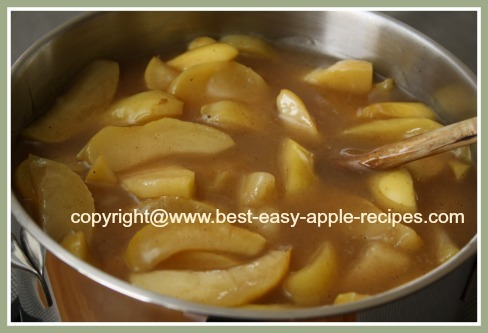 Reduce heat to low, and allow to simmer gently until the apples are fork tender but not mushy. (Gently turn apples frequently to avoid sticking and burning.) About 20 minutes. 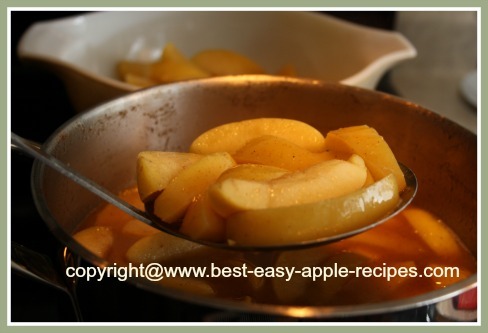 Remove the apple slices from the juice using a large slotted spoon, and place the apples in an oven safe dish. 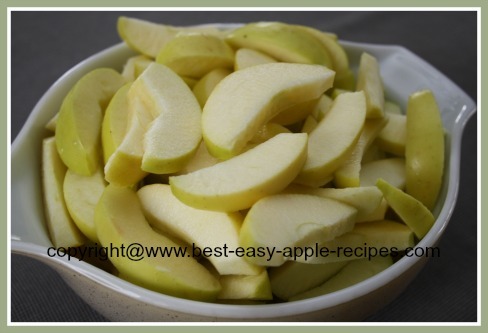 In a small bowl combine the remaining 1/2 cup of apple juice, cornstarch and the sugar. Whisk until well combined. Whisk the mixture into the hot apple juice in the pan, and cook, stirring constantly on medium-high heat until the juice bubbles and becomes thickened and smooth. Remove from heat. Return the apple slices to the pan and stir gently to combine. Serve warm over ice cream, pancakes, waffles, or as a dessert or a side dish to any dinner. I like to add fresh or frozen cranberries to the mixture and allow them to simmer with the apples slices for a few minutes before removing the apples from the heat. The cranberries and apple mixture makes a great dish for Easter, Christmas or Thanksgiving Dinner too! Mix the ingredients together until well combined, and store in a sealed container, in a cool, dry place.